"Like the essence of a Mediterranean summer distilled into a sweet herbal syrup. Stir it into lemonade, flavor a cocktail, glaze a cake, or churn it into a sorbet. So refreshing. Store in the refrigerator for up to 1 month." Combine water, sugar, and rosemary leaves in a small saucepan. Bring to a boil, stirring until sugar dissolves. Simmer for 1 minute. Remove from heat and let syrup steep, about 30 minutes. 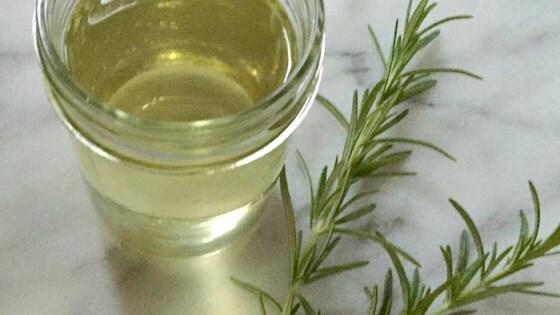 Pour syrup into a sterilized glass jar through a mesh strainer to remove rosemary leaves; let cool. Delicious!! Mix with freshly squeezed lemons and vodka! Easy, sime. Technically you could make it with just a microwave but there is something about open boils. I bit overly sweet, heads up, taste as you add sugar.